The TC Electronic HyperGravity Mini Compressor Guitar Effects Pedal is the perfect little magic box that will give your tone the push it deserves to take you from average to epic. As with everything they do, TC Electronic have pushed the boat out to make this compact pedal a must-have for even the most discerning, space-conscious guitarists. The HyperGravity Mini is endowed with TC Electronic's highly advanced multiband dynamics algorithm - MD3 compression algorithm -, which can be found in their studio production wonder, System 6000, the go-to production tool for over a decade. With ready access to industry standard compression at your disposal, you'd think TC Electronic would stop there. However, you'd be wrong. 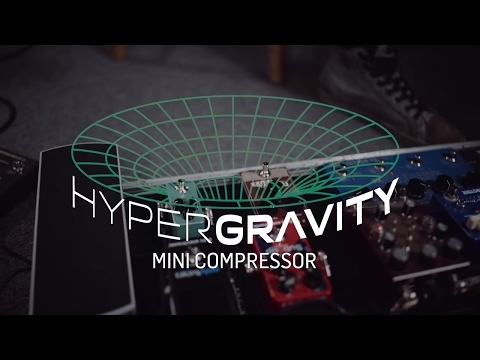 The HyperGravity Mini also boasts that warm, vintage compression that we all know and love, giving you the best of both worlds. By now I think we are all aware of TC Electronic's awesome TonePrint tech, but for the uninitiated, here is a brief overview. TC's TonePrint editor allows you to dive deep into the world of patch editing, and enables you to create your own TonePrint's from scratch. In the case of the HyperGravity Mini Compressor, you can control effect behaviour, knob ranges, and everything in between. Alternatively, you can select one of TC Electronic's many TonePrints that have been created by some of the world's top artists.